Travel to various different countries worldwide nowadays makes the transmission of these pests very easy. Bedbugs are normally 5-7mm long with clawed feet that enable them to climb rough surfaces. They generally come out at night and hide during the day, but with heavy infestation sightings are possible during daylight hours. These parasites are blood feeders, and they crawl into beds during the night while their victims are sleeping. 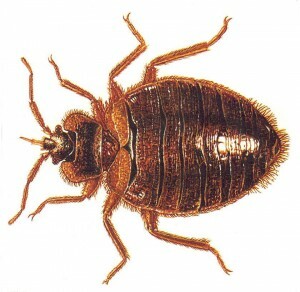 The bite is painless and a number of bed bugs may feed for an extended period of time on any area of exposed skin. The resulting bite wound may show generalized minor swelling into a raised bump followed by itching. Bed bugs are sometimes associated with poor hygiene, movement of second hand furniture or antiques. Eggs are deposited in small cracks in the bed frame, mattress seams, or or furniture near the bed. The nymphs and the adults reside near one another, hiding in such cracks awaiting nightfall when they might venture out to feed. In some cases, the offending bed bugs are harboring many feet from the bed in cracks in furniture, doorframes, or even within voids in the wall. Bed Bug Pest Control Measure: Thorough treatment is essential we recommend a residual surface spray to all affected areas.